Need a new passport? All US citizens planning on traveling internationally by air need a valid US passport, including newborns. If you are traveling by land or sea to Mexico, Canada, or the Caribbean, you can use either a passport book or a passport card. However, it is highly recommended that you obtain a valid passport book in case of an emergency. You may need to fly home unexpectedly. A first-time passport applicant is likely to have many questions, so we have prepared a helpful guide to simplify the process. Most importantly are eligibility requirements and necessary documents that you will need to prepare. Next, we will go over the step-by-step process to get your new Adult passport. You are a first time applicant and have never been issued a US passport. Your most recent passport was issued when you were age 15 or younger. 1 Gather all documents required to apply for a new US passport. New Passport Application Form (DS-11), completed offline or filled out online at https://pptform.state.gov/ and printed. New US Passport application fee – You will need two checks, one made payable to “US Department of State” for $110 ($170 if you need to expedite a new passport) and a second check for $25 for the Passport Acceptance Agent fee. By Mail – The Passport Acceptance Agent will send in your sealed envelope to be processed at the National Passport Center. At a Passport Agency – If you are in a rush for a new passport, you can visit US Passport Agencies located in major US cities, where your new passport will be processed on-site. By a Passport Expediting Company – If you need to expedite a new passport, you can send your sealed envelope to a reputable passport expediting company, who will hand-carry your application to a Passport Agency to process your passport fast. Applicants age 16 or 17, who are not yet legal adults, should be accompanied to the Passport Acceptance Agent by one of their parents to show “parental awareness” that they are applying for a new passport. 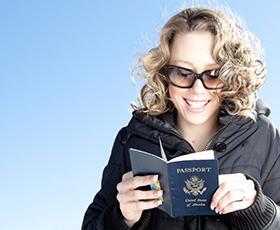 If the traveler needs to go to the Acceptance Agent alone, they can take a signed letter from a parent stating that the parents approve of the passport request, along with a photocopy of the parent’s passport or driver’s license. Applying for a new passport by mail will take up to 8 weeks. If you opt for expedited service by mail, for an additional $60 government fee, your passport will arrive in 2-3 weeks. If you are in a hurry for a new passport, you can either go to a Passport Agency in person or use the services of a passport expediting company. These companies can get you a new passport in as little as 24 hours. Passport Agencies are located in 26 major US cities across the country, and you will need to make an appointment to visit one by calling the National Passport Information Center at 877-487-2778. Using a passport expediting company will save you the hassle of making an appointment to apply in person and is the fastest and easiest way to obtain a new passport.